TRAI forces BARC to make data public, but how do the numbers look like? BARC India finally succumbed to persistent pressure from the Telecom Regulatory Authority of India (TRAI) and put viewership data in the public domain. Replying to the show cause notice issued by TRAI, BARC had called it ‘against public interest' earlier this month. However, with the release of viewership data for Week 13, a lot of disruption is quite visible across the genres because of the implementation of the authority’s new tariff order. Beginning with Hindi general entertainment channels, the pecking orders in all the markets have thrown surprises. 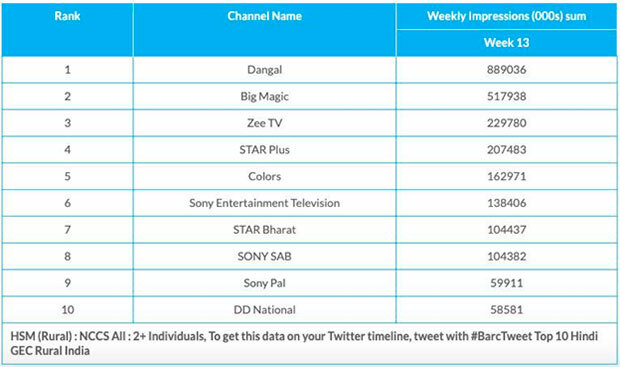 Star Plus is the Urban leader while free-to-air channel Dangal has topped Rural and U+R markets. 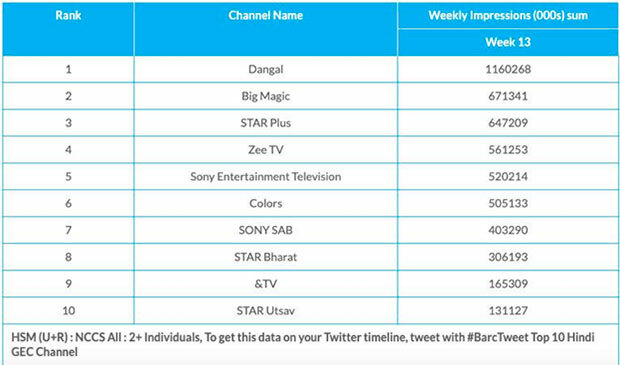 While Star Plus and other pay channels have almost maintained their viewership they garnered in the past, which is around 400 million Impressions, Dangal and Big Magic have not only topped the charts in Rural and U+R markets but smashed all-time television viewership records by any channel. These channels performed on the back of their availability on DD Freedish as the only entertainment channels after Zee Anmol, Rishtey, Star Utsav and Sony Pal decided to drop out of Freedish. 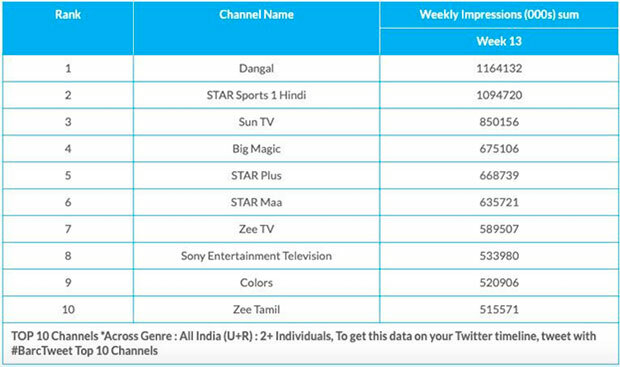 Dangal recorded a gross viewership of 1,164 million Impressions leaving Star Sports 1 Hindi behind, which is also at a staggering 1,095 million Impressions. A record of a sort for any sports channel was recorded despite it being a pay channel on the back of IPL’s popularity. English general entertainment has got Comedy Central as leader followed by Star World but the other channels in the genre, including AXN and Zee Cafe, looked in distress. English movies channels have also lost a lot of viewership due to the NTO. The news genre is quite stable as both Hindi and English news channels have maintained their viewership as compared to pre-NTO period. However, Aaj Tak taking the lead by a significant margin from No. 2 despite being a pay channel is encouraging for strong brand owners.